The purposes of the Society shall be to foster, promote, support,augment, develop and encourage investigative knowledge in Dermatology and Dermatologic Surgery; to promote the highest possible standards in clinical practice, continuing education and research in Dermatology and Dermatologic Surgery; to promote the highest standards of patient care and promote the public interest relating to Dermatology and Dermatologic Surgery and to provide a forum for the exchange of ideas and methodology for Dermatology and Dermatologic Surgery and related basic sciences in Connecticut. Left: Deb Osborn with Senator Joe Crisco, co-chair of insurance at his popular Senior Fair. Right: Majority leader, Senator Martin Looney at the New Haven Senior Fair. 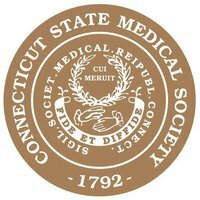 The Connecticut Dermatology and Dermatologic Surgery Society supports the following positions statements published by the American Dermatology Society and or the American Society of Dermatology Surgery. 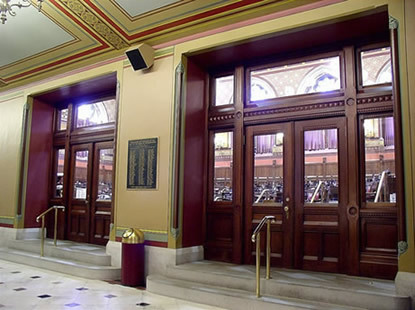 The Connecticut Dermatology and Dermatologic Surgery Society testifies each year on various legislative bills through public hearings at the State Capitol promoting patient advocacy and protecting the practice of Dermatology and Dermatologic surgery. In Support of SB 54 An Act Concerning The Use Of Indoor Tanning Devices By Persons Under Eighteen Years Of Age. The Connecticut Dermatology and Dermatologic Surgery Society heads to the state Capitol each year with teams of physicians, who meet all day with legislators on medical issues. In 2018 the day at the Capitol was held on Friday, March 16, 2018. Look for notices on our next Day at the Capitol to be held on Friday, March 1st, 2019. 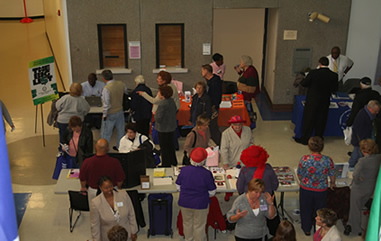 The Connecticut Dermatology and Dermatologic Surgery Society participates in over a dozen public health fairs in Connecticut, promoting Dermatology and the proper care and treatment of the skin.